A Study of Proximity Focusing RICH with Multiple Refractive Index Aerogel Radiator A Study of Proximity Focusing RICH with Multiple Refractive Index Aerogel. 1 A Study of Proximity Focusing RICH with Multiple Refractive Index Aerogel Radiator A Study of Proximity Focusing RICH with Multiple Refractive Index Aerogel Radiator 1 I. Adachi, 2 I. Bertović, 3 K.Fujita, 4 T. Fukushima, 2 A. Gorišek, 3 D. Hayashi, 3 T. Iijima, 3 K.Ikado, 5 M.Iwabuchi, 4 H. Kawai, 6,2 S. Korpar, 3 Y. Kozakai, 7,2 P. Križan, 4 A. Kuratani, 8 T. Matsumoto, 3 Y. Mazuka, 8 T. Nakagawa, 1 S. Nishida, 5 S. Ogawa, 2 R. Pestotnik, 8 T. Seki, 8 T. Sumiyoshi, 4 M. Tabata, 1 Y. Unno 1:IPNS, KEK, Tsukuba, Japan / 2:J.Stefan Institute, Ljubljana, Slovenia / 3:Dept. of Physics, Nagoya Univ., Nagoya, Japan / 4:Dept. of Physics, Chiba Univ., Chiba, Japan /5:Dept. of Physics, Toho Univ., Funabashi, Japan 6:Faculty of Chemistry and Chemical Engineering, Univ. of Maribor, Maribor, Slovenia 7:Faculty of Mathematics and Physics, Univ. of Ljubljana, Ljubljana, Slovenia / 8:Dept. of Physics, Tokyo Metropolitan Univ., Tokyo, Japan presented by Peter Križan (peter.krizan@ijs.si) Aerogel radiator Position sensitive PD with B=1.5Tesla Cherenkov photon 200mm n=1.05 Proximity Focusing RICH with Aerogel Radiator Developed for a new particle ID device in the Belle forward region improve  /K separation up to 4  at 4 GeV/c limited space operational under 1.5 Tesla magnetic field Key components Hydrophobic aerogel with refractive index of ~1.050 as a Cherenkov radiator Position sensitive photodetector with ~5x5mm 2 pixel size Electronics for read-out Belle detector Performance Test at 2002 Beam Experiment n=1.05 aerogel radiator  =14mrad Npe = 6 4  separation confirmed  4.0GeV “K”4.0GeV typical event RICH prototype counter Hamamatsu Multi-anode Flat-Panel PMT(H8500)  /K 4  separation at 4 GeV/c achieved with a prototype counter  need more photoelectrons for a further improvement as well as for more robustness HOW ? R&D project since 2000 Innovative idea to Get More Photoelectrons w/o Degrading Resolution Simple accumulation of aerogel layers allows to detect more Cherenkov photons, however it deteriorates overall resolution. n1n2 n1<n2 Employ multiple layers with different indices so that Cherenkov images from individual layers overlap on the photon detector. Concept Validation in Beam 4cm-thick single index aerogel   (1p.e.) = 22 mrad Npe ~ 10.6   (track) = 6.9 mrad Focusing by 2cm+2cm aerogel (n1:1.047, n2:1.057) n1 n2   (1p.e.) = 14.4 mrad Npe ~ 9.6   (track) = 4.8 mrad Novel idea of dual radiator “focusing scheme” has been proven  Only possible because refractive index of aerogel radiator can be adjusted in the production  Require further improvement of aerogel transparency not only for n=1.050 but for other indices Progress in Aerogel Radiator Production Measured index Transmission length at 400nm(mm) old synthesis method Transparency improvement for samples with n=1.040~1.060 Crack-free large sample has been made 110x110x20mm 3 150x150x20mm 3 n =1.050 refractive index control  n = 0.0003 index deviation from average Extension of the new concept: multiple layer radiator High accuracy of index is advantageous for dual/multiple layer radiator configurations 2001 sample Target index Averaged transmission length at 400nm 1.045 46.6  1.4 1.050 40.4  1.1 1.055 32.8  1.1 1.060 28.9  0.7 1.045 1.050 1.055 1.062 # of photoelectrons ▲ ： single index layer ● ： multiple layer 1st 2nd 3rd 4th 1st 2nd 3rd 4th ▲ ： single index layer ● ： multiple layer With new aerogels provided, we have examined the performance by stacking more layers during a 2005 beam test single photon resolution Comparison between single index and multiple radiator schemes(3.0 GeV/c pion beam) resolution per track best  (track) = 4.2 mrad We have succeeded in getting more Npe without an increase in the single photon uncertainty. Single index radiatorn = 1.045 only Multiple layer radiator n1 = 1.045 n2 = 1.050 n3 = 1.055 n4 = 1.062 |  (  )-  (  )|/  (track) ~5.5  separation achieved for 4 GeV/c with Npe= 9.1 Progress on aerogel optical quality has been examined in test beam radiator thickness(cm) Npe 2001 sample 2005 sample Significant increase of Npe observed for 2005 sample, while old sample gets saturated around Npe~4.5 Transmission length at = 400nm more than doubled 10mV Conclusions 1.In 2004 we have introduced and tested a new technique which uses multiple aerogel tiles with different indices so that Cherenkov photons can be imaged to overlapping rings. With this configuration, we have demonstrated a 5.5   separation with ~9 photoelectrons in the 2005 beam test. 2.Optical quality of aerogel tiles has been significantly improved. As a result, photoelectron yield has been doubled. The radiator size can be enlarged by 86% and crack free sample was obtained. 3.We have tested additional time-of-flight capabilities of such a counter. Both Cherenkov photons from the aerogel radiator as well as from the PMT window can be used. The latter would allow to extend the PID capabilities of the counter to particles which are below the Cherenkov threshold in aerogel. References 1.T.Iijima et al., NIM A543(2001)321. 2.T.Matsumoto, S.Korpar et al., NIM A521(2004)367. 3.T.Iijima, S.Korpar et al., NIM A548(2005)383. 4.I.Adachi et al., NIM A553(2005)146. 5.P.Križan et al., physics/0603022, to be published in NIM A. Additional feature: RICH+TOF Idea: Make use of the fast photon detectors and measure time-of-flight with Cherenkov photons from aerogel and from the PMT window The Cherenkov photons from the window: can be used for particles below the threshold in aerogel  The separation in Belle should be even better: flight distance ~2m (instead of 0.7m in the beam test set-up). Beam test data: 50ps resolution per single photon  ~20ps per track ~38ps per track Separation of pions and protons at 2 GeV, flight distance 0.7m. Download ppt "A Study of Proximity Focusing RICH with Multiple Refractive Index Aerogel Radiator A Study of Proximity Focusing RICH with Multiple Refractive Index Aerogel." Study of 144-channel Hybrid Avalanche Photo-Detector for Belle II RICH Counter VCI2010 Susumu Shiizuka Nagoya University for Belle II Aerogel RICH group. Peter Križan, Ljubljana Peter Križan University of Ljubljana and J. Stefan Institute The HERA-B RICH counter. 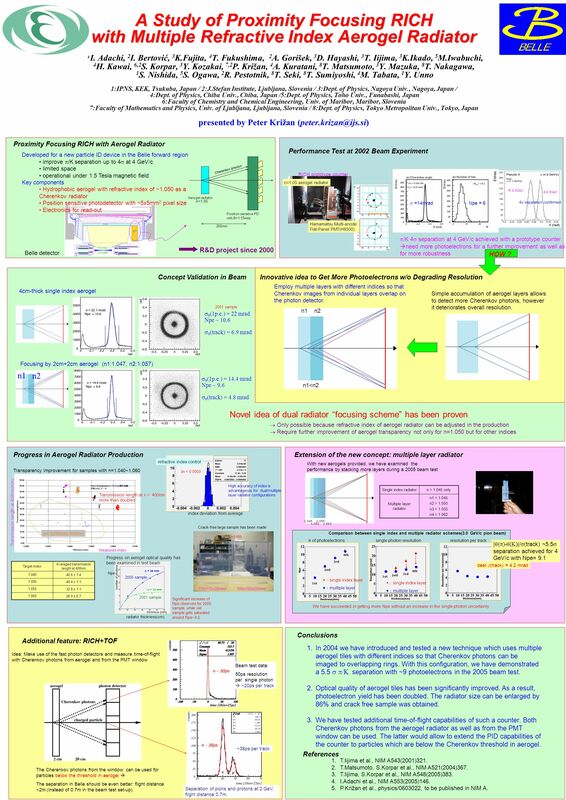 The Multi-Pixel Photon Counter for the GLD Calorimeter Readout Jul Satoru Uozumi University of Tsukuba, Japan 1.Introduction 2.Recent. CLAS12 – RICH PARAMETERDESIGN VALUE Momentum range3-8 GeV/c  /K rejection factor Not less than 500  /p rejection factor Not less than 100 Angular coverage5. Makoto Tabata Japan Aerospace Exploration Agency (JAXA) TIPP 2011 in Chicago Recent Progress in Silica Aerogel Cherenkov Radiator. Peter Križan, Ljubljana April 20, 2005Super B Factory Workshop, Hawaii Peter Križan University of Ljubljana and J. Stefan Institute For Belle Aerogel RICH. PID Nagoya univ1 The possibility of improving TOP counter Nagoya university Yuji Enari. MICE: The International Muon Ionization Cooling Experiment Diagnostic Systems Tracker Cherenkov Detector Time of Flight Counters Calorimeter Terry Hart. Could CKOV1 become RICH? 1. Simulations 2. Sensitive area of the detection plane 3. Example of a workable solution 4. Geometrical efficiency of the photon. TOF/ACC test Overview M. Yoshida Osaka Univ.. TOF / ACC in the prototype test For the prototype test in May, we will need PID: –TOF counter Distinguish. Copyright © Hamamatsu Photonics K.K. All Rights Reserved. Oct at NNN07 Workshop Hamamatsu Photonics Electron Tube Division Recent Progress in PMTs. Marco Musy INFN and University of Milano-Bicocca Pylos, June 2002 Aerogel as Cherenkov radiator for RICH detectors for RICH detectors. T. Sumiyoshi (TMU) 30, Nov del Carmen 1 Development of HPD （ＨＡＰ Ｄ） Photon-detector for the Aerogel RICH Photon-detector for the Aerogel. The HERMES Dual-Radiator Ring Imaging Cerenkov Detector N.Akopov et al., Nucl. Instrum. Meth. A479 (2002) 511 Shibata Lab 11R50047 Jennifer Newsham YSEP. Status and Physics Prospects of the SuperKEKB Project Y. Horii Tohoku Univ. (Japan) 1 5th March 2011, La Thuile 2011. Position Sensitive SiPMs for Ring Imaging Cherenkov Counters C.Woody BNL January 17, 2012.